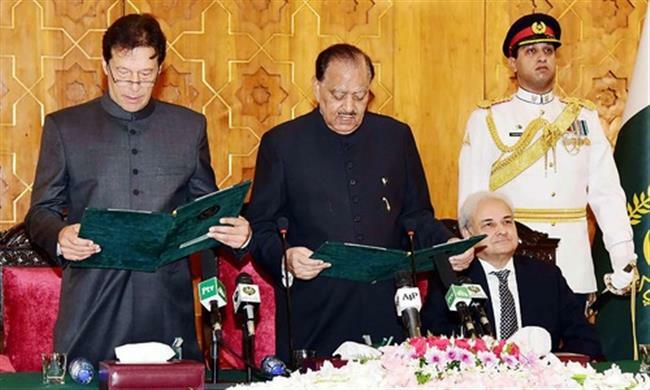 Islamabad: Imran Ahmed Khan Niazi was on Saturday sworn in as the 22nd prime minister of Pakistan in a simple ceremony hosted at the Aiwan-i-Sadr. The ceremony marked an end to decades of rotating leadership between the ousted PML-N and the PPP, punctuated by periods of military rule.After taking oath as premier, Khan and First Lady Bushra Imran greeted various guests and accepted felicitations from them. Imran Khan inspects a guard of honour at PM House. First Lady Bushra Imran in attendance at the oath-taking ceremony. Indian cricket star Navjot Singh Sidhu at the ceremony. A notification issued by the Cabinet Division after the ceremony said Khan has entered the office of the prime minister after taking the oath.